While taking a couple days off from the World Baseball Classic, I realized that I had been severely neglecting my Cardinals. It is an easy thing to do when only about half the games are broadcast on the radio, even fewer are televised and most all take place while I am at work. Work is like a sacrifice fly. I do not get on base, but I score the funds to live in an enclosed space, eat ballpark hot dogs and wear clothes adorned with the birds on the bat. Just because the opportunity to savor Spring Training games has been sadly lacking, do not think I have not been paying attention to my beloved Redbirds. Thanks to the fine beat writers at stlcardinals.com and stltoday.com, I get the daily scoop. Blessedly, for the most part, I like what I hear. The starting rotation is shaping up. The headline is a healthy and sharp Chris Carpenter that has yet to give up a run. Kyle Lohse has pitched the most innings and has a 3-1 record. Joel Pineiro has a low 1.29 ERA. Adam Wainwright is has good command of his fast ball. Todd Wellemeyer has been burned by the long ball, but I know he will work that out. How do I know? Well, I will tell you in a bit. Jason Motte has excelled in the bullpen going 4-4 in saves vs. save opportunities, with an ERA of 1.08. Josh Kinney is 2-2 in saves with a 1.29 ERA. Chris Perez has struggled with shoulder soreness, but he still has time to come around. Ryan Franklin, the bullpen veteran, is coming along nicely. As is lefty, Trevor Miller. At the start of Spring Training, positional player questions were plentiful. (Try to say that 5 times fast). Now, it seems we have options. Many young players have made a strong case for themselves. Joe Mather seemed a lock for the temp job at third base. Now, Brian Barden, batting .419, is coming on strong. The innovative idea to take one of the plenteous outfielders and turn put him in the open slot at second base is working out. Skip Schumaker is making a go of it at second. He had some errors, mostly on throws. He seemed to have a little too much arm for the position. But, he is turning double plays and getting the job done. All the extra work in the field has not taken away from his hitting. He is batting .345. Also garnering attention as a possible utility infielder is Joe Thurston. He has some speed with two stolen bases. Brendan Ryan is another possibility. One more infielder worth mentioning is Craig Allen. Allen played at Double-A Springfield last year. I watched one Springfield game last year and Craig stood out. He is projected to be at Triple-A Memphis this year, which is rather sad since he is batting .444 and slugging .667. What more could a guy do in Spring Training? The final question mark is tattooed on the forehead of one young highly touted prospect. Fine, Colby Rasmus’ forehead is tattoo free, but the question gets asked over and over and over: When will Rasmus get the call-up? The jury is still out. Rasmus got off to a slow start, but after a little sit down chat with the skipper, he is hitting very well. Overall the Cardinals are 14-6, which puts them in second place in the Grapefruit League. I know, it means nothing. But, it is positive. Very positive. Which is the opposite of a negative like this one: Houston‘s 3-16 record. It makes for a happy, hopeful spring for Cardinals fans. The hardest thing to do in baseball is hit that little round leather orb with the wooden stick. If that is true, then MLB 2K9 is very realistic. I had a little time to play today, and I finally figured out how to swing, but offensively, I stink. I have mastered the groundout to third, as well as the groundout to short. Through no fault of his own, Yadier Molina struck out more times today than he did all season last year. I am ridiculous. My fielding is getting better. Of course, the only way to go is up when you start with 16 errors in one game. However, I can really pitch. Todd Wellemeyer is going to be just fine this season. I know this because Welly and I pitched an amazing game today. Complete game, no-hitter, with 23 K’s. Yep, it is a new Major League record. Our first pitch slider was un-hittable. Then a changeup would usually get strike two. Finally, the payoff pitch: a little high, inside fastball to finish the hitter off. We were dominant. We were efficient, finishing the game on 82 pitches. But, we still lost. Our pinpoint control vanished just long enough to allow a walk, a stolen base and two wild pitches, which scored the runner. I think Molina could have blocked the wild pitches, but he was mad at me for making him look so ghastly at the plate. Pirates win 1-0. Maybe, we will get ’em tomorrow. I enjoyed a couple days off, but I am excited for the finals. With no baseball on TV this afternoon (well, there was a cubs game, if that counts), I am embarrassed to admit I watched a Lifetime movie. I am a sucker for John Corbett, no matter how bad the movie. Baseball will be back on tonight to save me from myself! A few days ago, I wrote about going on a baseball bender when I saw how much baseball there was to see over the weekend. I mentioned that I might have a baseball hangover this morning. They say that the best cure for a hangover is the “hair off the dog that bit you”, so the best thing for a baseball hangover had to be a little more baseball. Fortunately, Korea and Japan were already playing in the Pool A finals of the World Baseball Classic when my alarm went off this morning. So, I turned on the TV and took my medicine. Japan humiliated Korea in their first match up. Korea had their revenge today. Korea plated one run in the fourth, and it was all they needed. Both Korea and Japan will advance to the next round, where they will face the top teams from Pool B (Cuba, Mexico, South Africa and Australia). Just a couple of aesthetic notes: I love the way the Japanese fans sing to their batter. Also, Japan‘s black batting helmets with the matte finish look tough. Nice change from the shiny ones we usually see. This game was going on at the same time as the game between Puerto Rico and Netherlands. I had one of the TV and one on my computer. Very hard to keep track of both, and I admit a bias toward watching the Puerto Rican game. I do know this: Canada had lots of runners that they could not bring home. Eleven runners left on base. There have been other upsets: Netherlands over the Dominicans and Australia over Mexico. But, this might be the biggest because it eliminates Canada. The Italians will advance to face the Venezuelans once again. 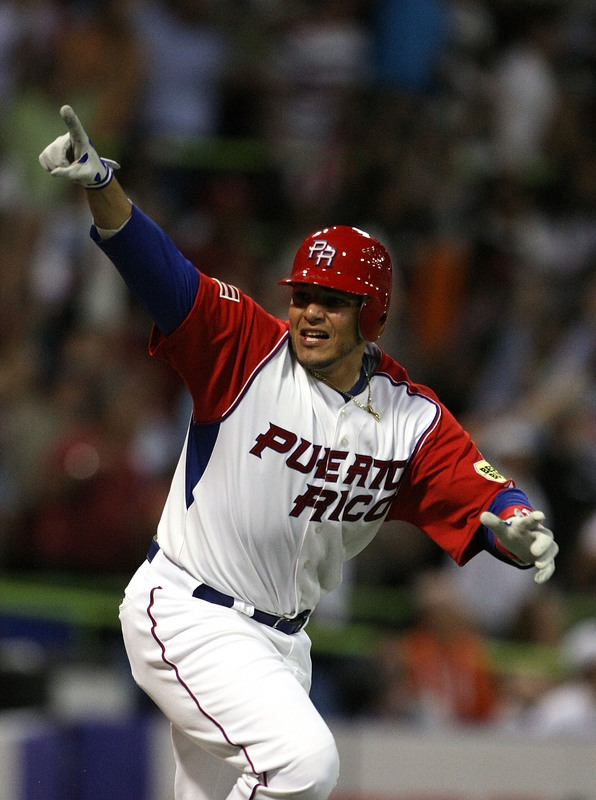 For an awfully long time in the game, it appeared that the Netherlands would continue their role as spoiler and upset the Puerto Ricans. In their home country. In a 1-0 game. The humiliation would have been unbearable. The Netherlands eked in a run and pitched seven shut-out innings. Pudge Rodriguez, who had a huge 4-4 game on Saturday, served as DH, and except for a single, the Netherlands pitching had him looking very uncomfortable at the plate. I will admit I was very frustrated during this game. OK, fine. I became that angry, shouting fan that I so dislike. They sent Bernie Williams from second on a single. I have nothing against being aggressive, but bless his heart, he was dead before he rounded third. Then, there was the wild pitch, and Aviles at 3rd did not go. He could have been in the dugout drinking Gatorade before the catcher tracked down the ball. Instead, he joined the long list of runners stranded. Perhaps, Puerto Rican Manager and St. Louis Cardinals Third Base Coach, Jose Oquendo should have been coaching third, rather like a minor league manager. I have no problem with small ball and bunting the runners over, but when Oquendo asked Yadier Molina to bunt with a runner at 2nd, I disagreed with the decision. Even though, I could see the point, I loudly disagreed. The bunt was botched. Enough said. I should have been more grateful for these debacles, because they set up one of the most beautiful things I have seen in this tournament. Many of the highlights of this Classic have come from the catchers. Catching runners stealing, pick-offs, blocking wild pitches, clutch hitting, power hitting and even base stealing. This game was no exception. 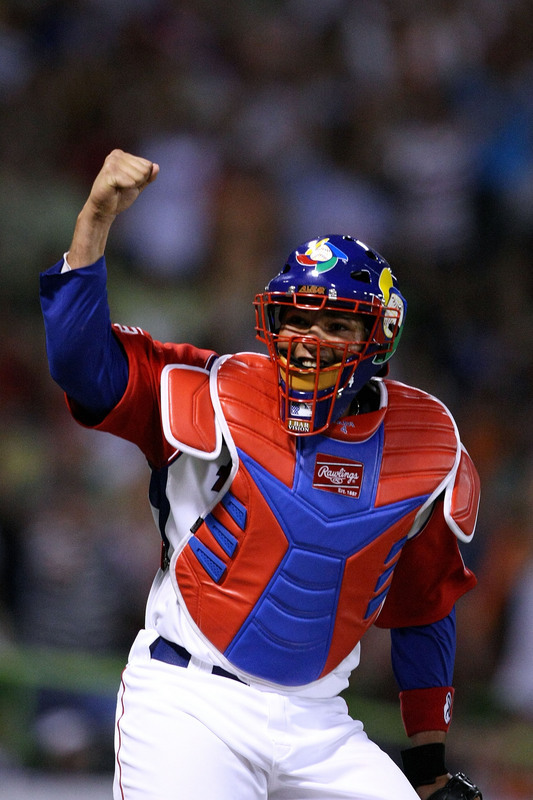 Enter: Gold Glove Catcher, St. Louis Cardinal, proud Puerto Rican, clutch hitter and my personal favorite, Yadier Molina. First, (because defense comes first with catchers) Molina had a beautiful strike ’em out, throw ’em out double-play to end the seventh inning. The throw was perfection! Next, in the eighth inning, the Netherlands pitching finally started to crack, walking the bases loaded. With one out, Molina comes to the plate, and drives the second pitch down the 3rd base line for a double, scoring two. This not only puts the Puerto Ricans on the board, but it puts them ahead. I shouted so loud, my dogs left the room. Not the angry shouting of earlier, but joyous shouting. A giant “YES!” I watched all weekend as various catchers had great games, and I enjoyed every single one, but I wanted MY catcher to have a great game, and he did! Yadi “Clutch” Molina strikes again. Jesus Feliciano drove in one insurance run, and the Puerto Ricans held on to the 3-1 lead in the ninth to win it. The Netherlands will face the Dominican Republic once again. Puerto Rico will wait to play the winner of that game. After being blown away by the Australians, Mexico needed to have a win. Not just to stay alive, but to salvage their pride. They got one. To the credit of the South Africans they managed to stay with in striking distance for much of the game. South African 2B, Gift Ngoepe hit back-to-back triples in his first two at-bats. On his third at bat, he was asked to bunt. What is the deal with asking the hot slugger to bunt? This was the third bunt attempt of the day that I questioned. And, the third one that failed. I am sure there is some baseball bible that lists the Ten Commandments for when a bunt is called for, based on outs, score and runners on base. I do not know these “rules”. And, if tonight was any indication, I do not think knowing them helps. In the seventh, Mexico took advantage of a walked in run and a throwing error that scored two. Adrian Gonzalez drove a nail into South Africa‘s coffin with a three-run homer in the eighth. Mexico got the decisive victory they needed, winning 14-3, eliminated South Africa from the tournament. Mexico will go on to face the loser of the game between Cuba and Australia. My copy of the video game, MLB 2K9, arrived yesterday. I only played for a short time, but as with most PS2 games, I was pretty horrible. Adam Wainwright and I were starting to get the hang of pitching, and my fielders were starting to get to the ball although they have to stop and think which button they need to hit to throw. Oh wait, that’s me. However, I can not figure out how to get the batters to swing the bat. It has something to do with the joysticks because every once in a while I could get one to swing, then I would try the same thing on the next pitch and my batter would just stand there. I know, I am a retard. Anyone know how to hit the ball? There is a two page list of commands, but no where does it tell you how to swing. It does tell you how to bunt, but we all know how I feel about that. I just peeked at my calendar for the weekend. I would like to tell you it was full of interesting social engagements. Wine-tasting. Jazz concert. Museum opening. Or, at least a kegger. Opening a bottle of wine, putting on Harry Connick, Jr. while browsing Art.com is as close as one gets to high culture in rural Oklahoma. A kegger could be had, but that is not the sort of thing that needs a calendar entry. What I found on my calendar was baseball and lots of it. With the World Baseball Classic and Spring Training underway, baseball will be on all day, all weekend. There is so much baseball that games actually overlap. Tomorrow afternoon, I will be listening to the Cardinals Spring Training game, while watching USA take on Canada in the first round of the WBC. After the long winter drought, I am suddenly overwhelmed by the possibility of an entire weekend of baseball. There is plenty of talk that the WBC games really do not mean anything. Neither do Spring Training games, for that matter. Maybe, they do. Maybe, they don’t. Nonetheless, I will be watching, because it is baseball. And, it is on. All weekend long. So, like an alcoholic in need of a drink, I am going on a baseball bender this weekend. But, I think I can handle it. I do not think it will be too much. Unless, of course, my copy of MLB 2K9 shows up in my mailbox tomorrow as Amazon.com says it should. In that case, I am going to have one raging baseball hangover on Monday.